The European Union’s energy targets respond to the need to move towards a more efficient and sustainable energy model regarding the use of energy and that allows our /the/EU’s external energy dependence to be reduced and contributes to the fight against climate change. In this regard, the European Union established years ago the well-known 20/20/20 Commitment, which subsequently was revised to give way to a new European strategy on energy sustainability for 2030 and 2050. To achieve these targets, it is imperative to move forward and bring about a change in the current energy model. Therefore, the European Commission presented in November 2016 the 'Clean Energy for All Europeans' package, which includes proposals and measures aimed at accelerating the transition to clean energy in line with the fulfilment of the targets set out in the 2015 Paris Agreement regarding the fight against climate change, while maintaining a reliable and competitive energy system that allows the delivery of energy to the consumer at affordable prices, contributing to the growth and creation of employment. 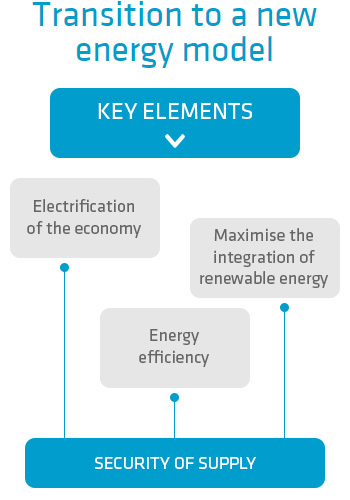 Advancing towards this new energy model involves the promotion of three key elements: the electrification of the economy, the maximum integration of renewable energy in the energy mix and efficiency, ensuring the security of supply at all times. Compensate for the reduced manageability of renewable generation. Flatten the demand curve (reduced peak/valley ratio). Future technologies for energy storage. Flexible consumers and smart grids. Development of interconnections and the supergrid.